The larva has grown 3mm since yesterday and is over 1/2 inch long. 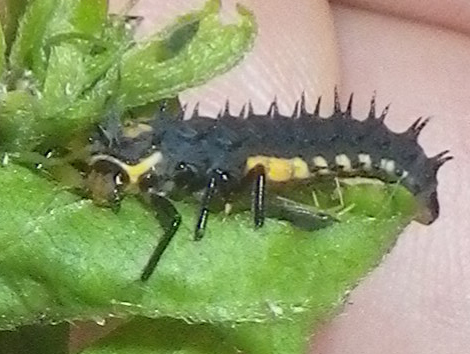 I submitted this photo to show what may be important ID factors if I can rear it to adulthood: the narrow pale front and side margins of the pronotum, the entirely-orange lateral tubercles on the first and second abdominal segments, and the orange areas around the dark spines on the third through seventh lateral tubercles. Moved from unidentified larvae and pupae.